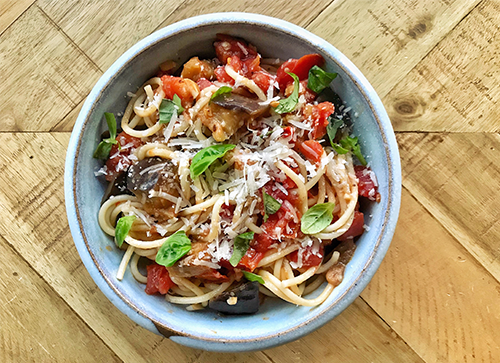 This pasta recipe captures everything we love about the transition from summer to fall: savoring the final peak-season produce of the summer while cozying up to warm, heartier dishes. Our dietitians recently made this in our Farm to Fork community nutrition class, and it received rave reviews. Eggplant is a great addition to pasta recipes because it adds substance with its meaty taste and texture. This recipe comes together quickly and can be modified in so many ways, making it ideal for weeknights. Consider adding other vegetables you are trying to use up, such as leafy greens or zucchini. Bring a large pot of water with 2 tbsp. salt added to a boil. Cook pasta according to package instructions. While the water is coming to a boil, heat olive oil in a large skillet over medium-high heat. Add the eggplant cubes and sprinkle them with ½ tsp. salt, and cook for 5-8 minutes until it begins to soften and brown. If the eggplant starts to look too dry, add a splash of water to the pan. Once the eggplant is browned, add the garlic and crushed red pepper (if using) and stir for about 30 seconds. Add the tomatoes and cook for about 15 minutes, stirring occasionally. If it looks too dry, add some water. Add the cheese and basil, stir to combine with the sauce. Taste the sauce and adjust seasoning, if necessary. Once the pasta is cooked, drain and add to the skillet. Toss everything together and remove from the heat. Add black pepper and more grated parmesan to taste, drizzle with balsamic vinegar (optional), and serve.